With engaging LIFEPAC 1st Grade Language Arts, your student will begin to learn sounds, write letters and simple words, and associate pictures with beginning letters. Units cover: Alphabet and Short Vowel Sounds; Rhyming Words, Adding –“ING”; Verbs, Blends and Silent Letters; Long Vowels and Syllables; and Phonics and Grammar Review. Worktexts filled with colorful illustrations capture the imagination of young minds! Feel pride as student's read their first stories and nursery rhymes, integrated into the text. Additional skills like tracing letters and words, matching objects by sound, and defining objects with words are also included. 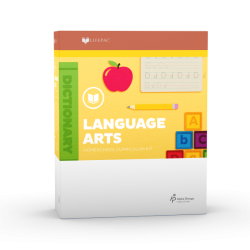 The LIFEPAC 1st Grade Language Arts Set contains ten worktexts, Reading Basics set of five reader, and two teacher's guides.